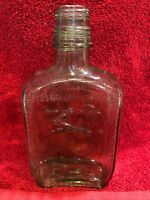 TUMBLED - BEAUTIFUL ANTIQUE GAELIC "OLD SMUGGLER" WHISKEY BOTTLE!! CRUDE! HEAVY!